Growing up Easter was one of my favorite holidays, we would do Easter egg hunts both at home and at relatives houses and we would always receive a basket full of goodies. Even though we lived life on a budget growing up, as I still do today my parents always made Easter very special. I knew it was important with my own children to develop special traditions for the Easter holiday so they could have the fond memories that I had of this day growing up. 1. Reuse your Easter baskets year after year this will let eliminate the cost of buying new baskets every year. Your children will also get used to what basket belongs to them making it easier for them to find it on Easter morning. 2. Remember to fill the bottom of the basket fully with filler to give the look of a full basket even when there is only a few items in it. Here are some great alternatives to using grass in the basket that takes up more space. 3. If you remembered to freeze some of your Halloween candy because let's face it the children get so much of it at Halloween, now it the time to take it out and add it to the Easter basket. 4. There is no reason to buy the Easter dye kits in the store, just reach into your cupboard and grab some of your food coloring and just mix 1 tablespoon of food coloring with 2 teaspoons of vinegar in a cup and then fill it to the halfway point with water and you are ready to begin coloring your Easter eggs. 5. 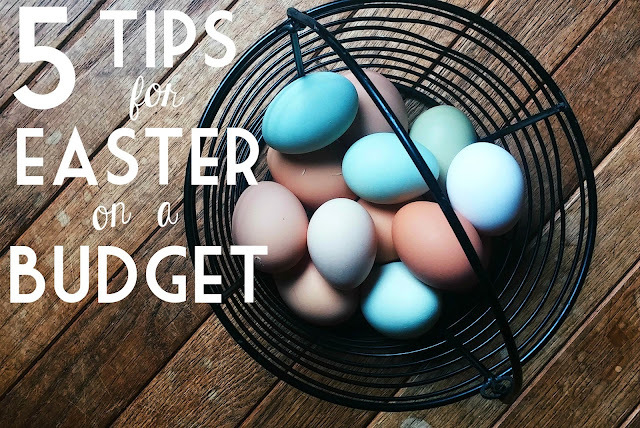 My biggest tip for doing Easter on a budget will not help you this year, but will help you next year remember to check the sales after Easter to pick up decorations and baskets that would be appropriate for your children saving a ton on the price and helping you stay on budget for next year.